Do you work long hours? Rent seem to be skyrocketing? Do you wonder if there’s a way to structure work for human needs? 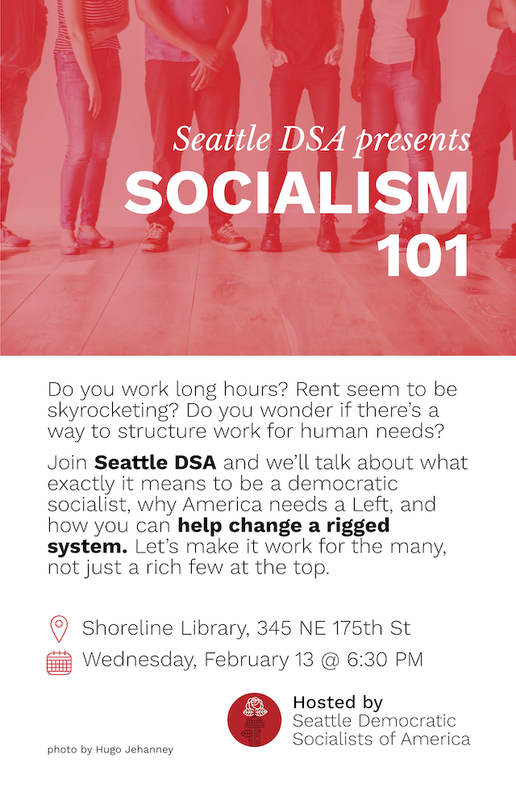 Join Seattle Democratic Socialists of America and we’ll talk about what exactly it means to be a democratic socialist, why America needs a Left, and how you can help change a rigged system. Let’s make it work for the many, not just a rich few at the top. Are you going to be speaking about the history of Socialism as well or just the Democratic Socialism and is there a difference? Are you going to give examples of socialism's success stories?